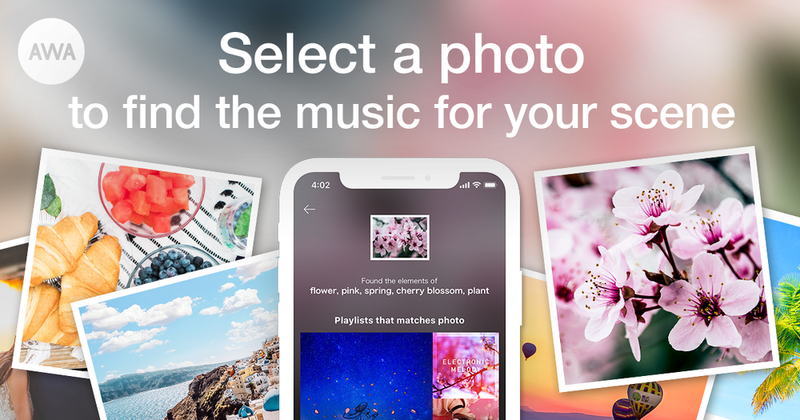 Starting from April 2, 2019 (Tuesday), we have launched a new feature on our iOS/Android app that recommends music to go with your photos. AWA first began offering the feature "#PhotoToMusic" in August 2018, which automatically replies with recommended music for photos that users posted on Twitter. This feature was well received after its release, and immediately became popular among Twitter users before trending in the Twitter rankings. Based on this response, we are now offering this feature "#PhotoToMusic", which was previously only available on Twitter, on our AWA iOS/Android app as well. By simply taking your favorite photo or selecting it, this feature will instantly analyze the elements of the photo and display music that is perfect for it based on AWA's own music data such as playlists and tags. We have a highly accurate predictive model in place from aggregating the big data collected by AWA in the 4 years since the service started, and this model will only become even more refined as it evolves with further use. While text is still widely used when searching for music, this feature offers the possibility of searching for the ideal music based on things that are difficult to communicate with words, such as the imagery or mood of a photo. Please take this opportunity to encounter new music based on your favorite photos or candid shots.